Rational Engineering Lifecycle Manager 6.0.2 "New and Noteworthy"
Rational Engineering Lifecycle Manager is a separately licensed product that you can install with the Collaborative Lifecycle Management (CLM) solution. The product is included in the CLM Web Installer; it is also included in the IBM Installation Manager CLM repositories. If multiple data sources are defined in Report Builder, you can select the data source for your view in the view creation wizard. For example, if your data sources are Lifecycle Query Engine and Lifecycle Query Engine using Configurations, you select Lifecycle Query Engine using Configurations to focus on specific global or local configurations. 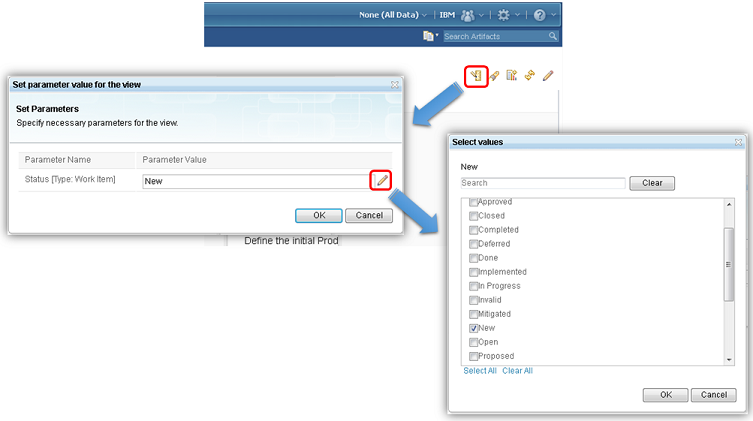 View authors can configure views to focus on specific projects. 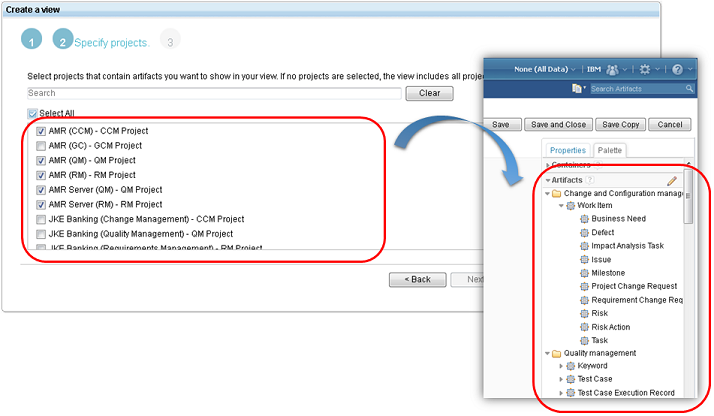 In the view creation wizard, select what projects to focus on. In the palette of the view editor, you will see only the artifacts that pertain to the selected projects. After you create the view, you can change what projects to focus on. Open the editor, and click the Limit scope button near Artifacts in the palette. From the projects that you include in the view, you can select specific projects to show in a particular containers. After you configure what projects to show in the container, the content of the container refreshes and shows only artifacts from the selected projects. Right-click a node, click Edit scope and conditions, and select your focus projects on the Scope tab. In the view editor, if you drag an artifact from the palette onto the canvas, you can filter the artifacts in the container. To easily set complex and fine-grained filters, right-click a node, click Edit scope and conditions, and configure the filter on the Conditions tab. 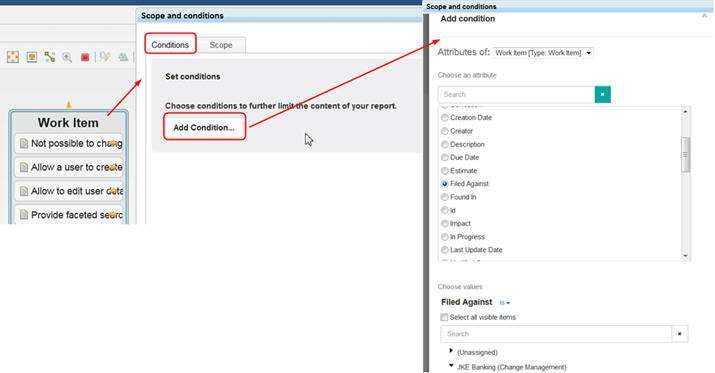 The procedure is similar to setting conditions in Report Builder. At run time, users can modify unlocked filters by clicking Set parameter value for the view. Artifacts are organized by type, and are retrieved directly from the index. You use the same artifacts when you build your reports in Report Builder. 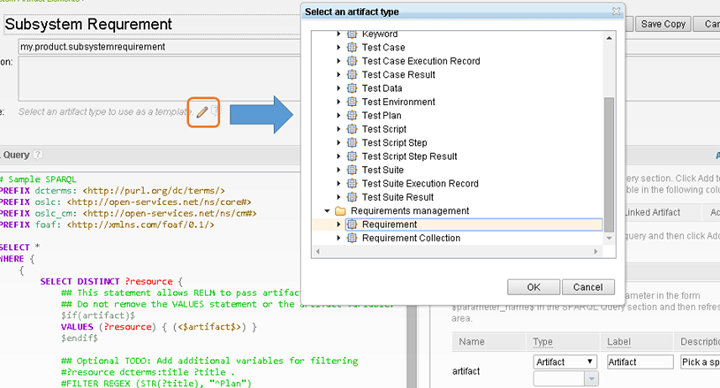 Custom artifact elements contain artifacts that are gathered from the index by a SPARQL query. In version 6.0.2, you can link between artifacts and custom artifact elements when you create views. Go to Views > Browse custom artifact elements, and click the pencil icon to edit one of the custom artifact elements in the list. In the editor, click the pencil icon next to the Template field, and select an artifact type. This way, you associate the custom artifact element with the selected artifact type. When you create views, you can now link between the configured artifact elements. Since version 6.0.1, view authors can use conditional parameters to change node parameters (such as fill color) based on attributes of the represented artifacts (such as task status). In version 6.0.2, view authors no longer have to enter property values when they configure conditions, they can easily select the property value from a list. This feature is also available when you edit custom artifact element nodes. 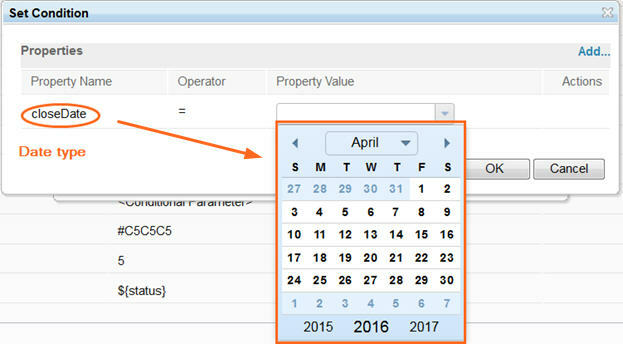 Condition operators change according to the property type. For example, the contains operator can be used with the string property, but not with the user or date properties. To determine what value applies if none of the configured conditions match, you can set a default value. 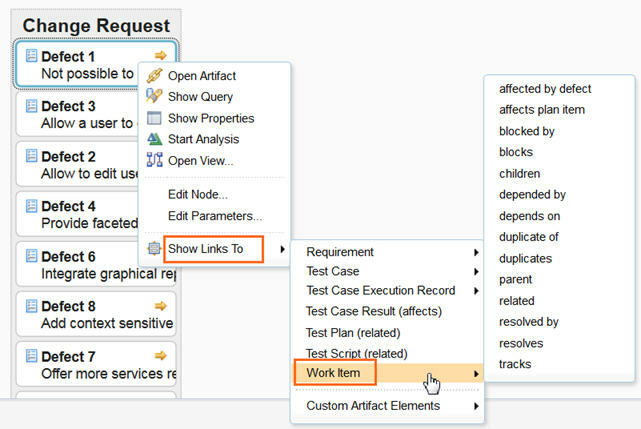 The configuration context menu is now similar to the menu in the Requirements Management and Quality Management application. To switch configurations, click Current Configuration > Switch. 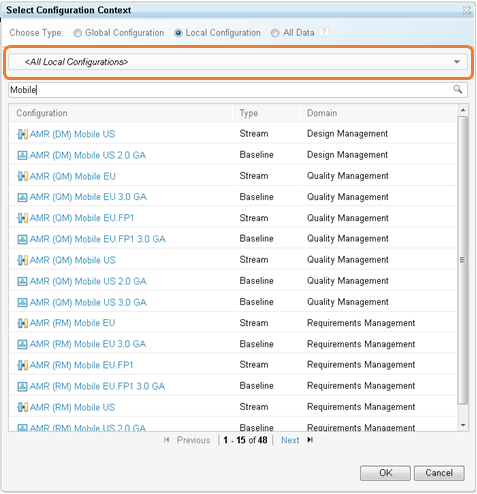 The Select Configuration Context dialog box shows configurations that are provided by the Global Configuration Management application, and by other applications that have configuration-enabled project areas. You can search for the configuration that you want to work in. If you select the Local Configuration type, and <All Local Configurations> in the drop-down list, you can search for a specific configuration across applications. If you select the All Data type, your views show artifacts regardless of configuration. When you create custom artifact elements (Views > Create custom artifact elements), a basic SPARQL query sample and some parameters are already available to help you get started. In the Template field, you can associate your custom artifact element with an artifact type. Click the pencil icon, and select an artifact type. 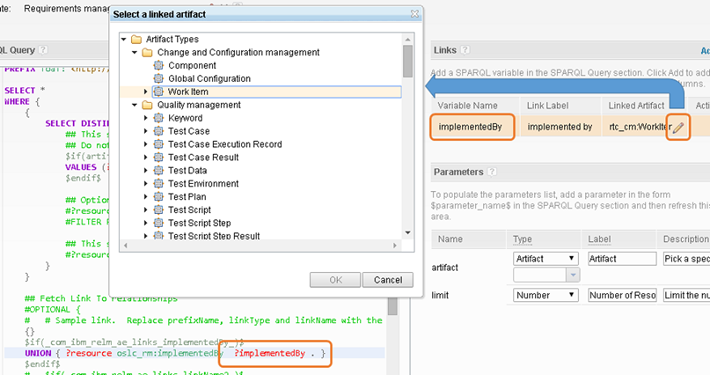 If you select, change, or remove an artifact type, the sample in the SPARQL Query window is refreshed. In the Links section, you can select an artifact type in the Linked Artifact field. If you select an artifact type, administrators who create views can link the new custom artifact element to corresponding artifacts, and to all custom artifact elements that are associated with the artifact type.